Capsule wardrobes are making it easier for ladies (& men) to get dressed everywhere! Capsule wardrobes are made up of timeless pieces that are the foundation or building blocks of any outfit—think a perfect pair of jeans or a trenchcoat. Still wondering how to accessorize a capsule wardrobe? 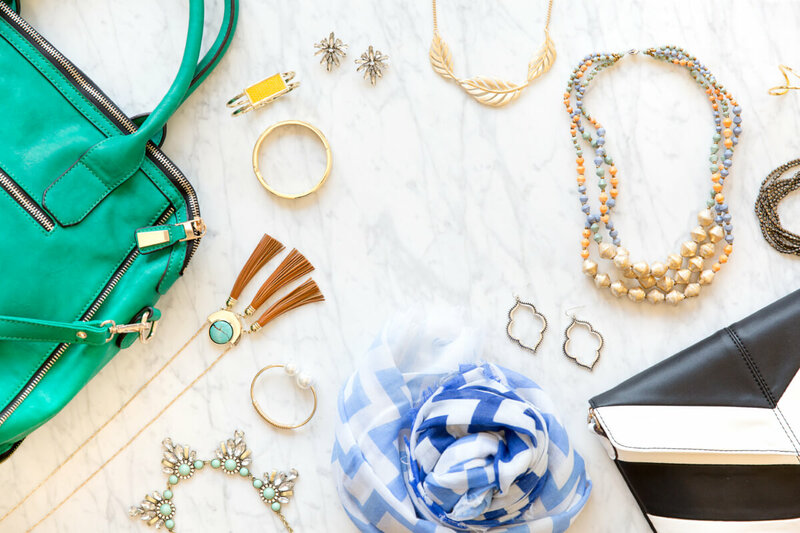 When it comes to accessorizing your capsule wardrobe, jewelry should be your first stop. Just like you built up your capsule wardrobe, build up your jewelry chest with pieces in your favorite metal (think gold, silver & platinum). Simple stud earrings, think a faux (or real) diamond or round metal beads. 16 or 18′ inch necklace in gold or silver. A classic watch with a leather or metal band. You have a closet full of essentials, but what about the essentials that you have to carry on the daily? Add a perfect handbag (or two) to your closet. One good place to start is adding a large, versatile tote for the workweek. A small, crossbody can get you through the weekend (or a night out). If you’re feeling a little more daring, try a handbag in a bright color—like cobalt blue, mustard yellow or even, fuschia! Take a style cue from the boys and pick up a black and brown belt to go with all of your capsule wardrobe outfits. A thin, black belt to wear with an all-black outfit. A 1-1.5″ thick brown leather belt to wear with skinny jeans and a striped shirt. Scarves can be belts too! Take a silky thin scarf and thread it through your belt loops of your favorite jeans! When it comes to accessorizing a capsule wardrobe, look for accessories that either add color to your capsule wardrobe or blend in seamlessly!